2. Antibacterial Properties- Thyme essential oil can kill off bacteria inside and outside the body. This herb can be made into a strong tea which can be used to disinfect skin and surfaces. Bacteria in the body are also killed off when exposed to thyme. 3. Upper Respiratory Infection Treatment-This herb has been used as a remedy for upper respiratory infections for centuries. Thyme helps to soothe irritated airways, fight off any infection in the lungs, and prevent bronchial spasms. 4. Immune Boosting Properties- One of the top health benefits of thyme is the immune boosting effect that this herb has on the body. The numerous antioxidants that thyme contains help your body stay healthy by preventing infection, illness, and disease. 5. Cancer Fighting Properties- Thyme tea can help prevent cancer. The terpenoids in this herb are considered cancer protectors and there is a significant amount of these compounds present. 6. Anemia Prevention and Treatment- Thyme is high in iron, and regular use of the herb can help prevent anemia and other blood disorders. 7. Nutritional Support- The health benefits of thyme include the fact that there are many essential vitamins and minerals in this herb that the body needs for optimal health and fitness. 8. Bad Breath Treatment- Thyme is one of the top bad breath remedies and helps to fight bacteria and infection in your mouth. Bad breath is usually caused by bacteria multiplying in the mouth. A thyme mouthwash can eliminate the bacteria that are the cause of bad breath. 9. Muscle Cramp Treatment- Treating menstrual cramps and other types of spasms in the body is another one of the top health benefits of thyme. This herb has also provided relief from other menstrual symptoms for many women. 10. 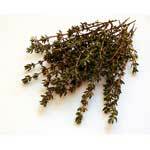 Bronchitis Treatment- Thyme is one of the proven bronchitis natural remedies. The herb can be very effective in cases where antibiotics are not used or have not worked well.